Sister Kathy is reunited with Sister Maria Goretti after 2 decades. Sr Kathy trained Maria and today she is the Congregational Leader of the Rosary Sisters. Initially up in PNG I was part of a community of three Josephite sisters who opened and taught in Suain in a parish primary school. It was quite a remote area on the northern coast. When school finished each afternoon we would work with the youth, the women and we would attend to any medical work that was needed. 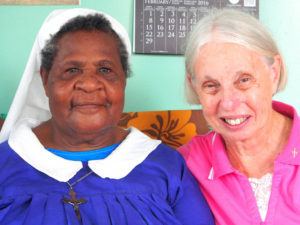 There were also two other communities of Josephite sisters in PNG. Up in Vanimo, four Josephite sisters set up a primary school, a vocational school for girls and later established a Diocesan Pastoral Centre for the training of lay leaders. The third community of Josephites was in Wasangela, in an isolated and remote bush area. The local people were extremely poor and yet they welcomed refugees from Irian Jaya. As I look back on my life as a Josephite sister I always come back to the years I spent in PNG. Not only did I feel that the missionary work of enabling and forming others was a privilege to be part of but I am a different person today because of the influence the people of that country had on me. When I first arrived in 1970, I am ashamed to say that I felt I had all the answers and was coming to “give to them.” In truth I learnt much more than I ever taught. Returning to PNG after all those years I knew that things would have changed, perhaps not even exist. The return, for me, was like catching up with old friends and just so affirming of the work that so many Josephite women had done over 25 years. True many of the buildings and structures we set up were not there but the training and enabling of the women and men to be their own leaders and messengers of the Good News was still alive and strong. It is with great joy that I welcome the congregation, through the work of Mary MacKillop International, reconnecting with this young nation and I am especially delighted that the area in which the Josephite sisters began working in 1966 is again going to see a Josephite presence. May the charism of Mary and Julian continue to grow in this isolated and poor area of the world.